I found myself the other day having a rather wacky exchange with someone, after provocatively pointing out that Donald Trump could turn out to be one of the great US Presidents. I cited some of my blog articles, giving what I deemed as evidence of him doing things that made a positive impact and him doing so better than his predecessors. This according to the person, whose views were likely opposite to my own, was opinion not evidence, although I did think the “achievements” cited spoke for themselves. Besides which, if one were objective, one should weigh the positive against the negative. In reality, concerning Trump, as with most, one awaits the verdict of history. Even then people disagree, because they attribute varying importance to what the candidate has achieved, good and bad. 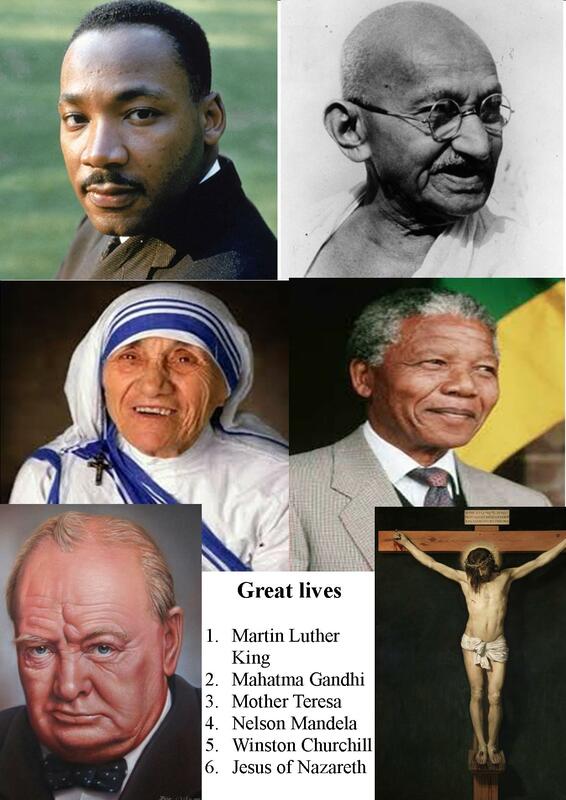 It got me thinking: who are the great figures of history? The first names that came into my head were: Martin Luther King, Mahatma Gandhi, Mother Teresa, Nelson Mandela, Winston Churchill, and the one that has to be top of my list: Jesus of Nazareth. Except for Jesus, all these characters were flawed and did things that were anything but great. I imagine that many of those who view the world differently to me might concur these were great people, even though there will dissension if I were to offer certain more controversial or obscure names for that accolade. I think what made these people great is they affected the lives of many and changed the world significantly for the better. I reckon, while for most of us our sphere of influence, in comparison, will be a lot less, there are still things we can do that would fit the greatness category because it makes a difference through enriching lives, even if in the general scheme of things such acts would appear to be modest. Also, arguably, aspiring to greatness is a good thing if done for the right reasons. It got me thinking about what it is that makes some people great and most people not great? Checking out definitions I find greatness is “of ability, quality, or eminence considerably above average” and synonyms include: prominent, eminent, pre-eminent, important, distinguished, august, illustrious, noble; celebrated, noted, notable, noteworthy, famous, famed, honoured, esteemed, revered, renowned, acclaimed, admired, well known; outstanding, foremost, remarkable, exceptional, highly rated, first-rate, incomparable, superlative, unsurpassed, unexcelled, matchless, peerless. It seems to me that while aspiring to greatness is a good thing, it is only so if it is to be and do good rather than feel and be seen as good, and that the best motives is so we can inspire the next generation to greatness. I also got to think from a theological perspective. If one were to take a eternal dimension, it is what God considers great what matters. I reckon when we get to meet God there will be many surprises and there will be those that none of us would have deemed as great, but God does, and those we considered as great, but God does not. I am reminded of the words of Jesus: it is those who are lowly, who become like children, who are great in God’s kingdom, and the greatest among his followers are those who are servants.